The GROHE Eurostyle Cosmopolitan sink mixer – versatile style and high build quality! A perfect blend of precision German engineering and versatile design! The GROHE Eurostyle Cosmopolitan sink mixer fits harmoniously in any kitchen and is also made from the finest materials to ensure it lasts a lifetime and is a delight to operate. The GROHE SilkMove ceramic cartridges ensure the control of water is velvet smooth and precise while the handy spout swivels through 140° at the lightest touch for maximum kitchen convenience. It’s also got an adjustable flow rate limiter and the gleaming GROHE StarLight chrome coating is scratch-resistant and very easy to clean – just wipe with a cloth and it looks pristine and new. 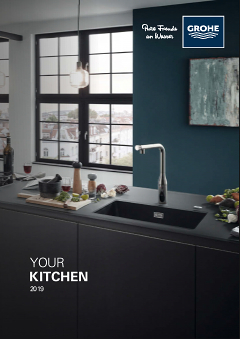 GROHE Eurostyle Cosmopolitan – a clever and quick way to add style and performance to your kitchen!